Do you have questions you've wanted to ask your local deputy but perhaps wasn't a good time for you? Do you want to know what's going on in your community and what we are doing to increase public safety? 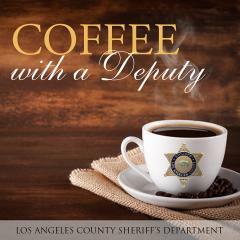 We've got a great platform to develope some community policing and get to know your local deputies on a personal level. Best of all, we get to share a cup of coffee and enjoy eachother's company. Join us for our Monthly Coffee with a Cop. The next location will Starbucks located at 39904 10th St. West, Palmdale, CA 93552 on Thursday November 1st from 9-10am.